Which CRM system would you recommend for a University? Do you have any advices for good choices for a CRM system for a university? What are the requirements a system like this should minimum have ? What are the must-have and the nice-to haves? Hallo Andrea, frankly, I would buy and of the shelf CRM system only if I would intend the processes implemented as default just like they are. most crm projects fail because people buy a fancy system with lots of pre-configured processes and functions - just to not use them and rather implement their old way of working. in this case it is wast of money and time. so, if you want to customise your processes into crm, rather get a customer master database, a workflow engine, and a web GUI low-code solution (all open software) and integrate yourself. If you are fine with using the processes that come with a commercial system, choose the system which offers processes you are most comfortable with, and use them as they are intended. and in this case, it is just consistent to choose a software as a service solution. that saves a lot of time, money and gets you up to speed as quickly as you can. I did a project with Newcastle university and Siebel CRM .... from memory the admissions process wouldn’t fit into it easily and the integrations with Education software like Blackboard were difficult too. AS above look for something that the off the shelf processes fit if possible. Hi Andrea, currently avaiable CRM solutions in the market are not the kinds “one size fits all” . I suggest you to identify the existing processes in the university (offcourse , which are serving the purpose and which are not) and then evaluate the most suitable and customisable option with lesser integration issues. Do not forget the importance of social media in information dessimination. 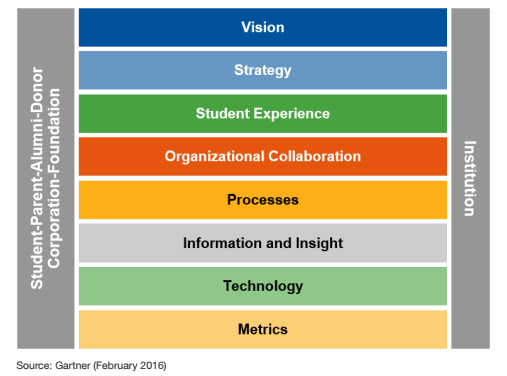 While designing the overall architecture of the CRM , you can refer to the attached image from Gartner. All the best ! Hi Andrea, I think the key points have already been well covered. Pls have a very clear view of the issues/problem areas you are trying to fix and how do you expect to fix it with a CRM system? Are you sure you don’t need a workflow management system? In any off the shelf CRM system, pls invest some time to understand how the processes are implemented in the software, before deciding to change them as per your existing processes. Customization brings its own problems of maintainability of code/changes and version upgrades in future. All the very best!! Most of the mentioned ootb-solutions are quite heavy and expensive. What are the major requirements - just keeping students data or also workflow management, invoicing or else ? Which systems are going to be connected ? Is there an integrated solution ? What is the budget and the time line for implementation ? These question would guide you to an application that fits best. Hello Andrew. Every single organization has a different request but is very expensive to create a bespoke CRM. What I suggest is that you look carefully at your needs and then the off the shelf CRM that is near to what you need you to give a trial and see. Thanks to all of you for your support and really good input. That is helping already to discuss options and the way to analyse the clients requirements. So at the end it will probably be a combination of adapting to the tool which is the closest to existing processes. Thank you Martina for all the links. They are very helpful. Not yet Osvaldo, we are in the process of defining the requirements of the universities. Thanks for offering to get in touch with you.